Air-Care is the leading provider of bio-contaminant evacuation solutions within the air duct cleaning industry. We have a unique understanding of the interaction between duct cleaning equipment, its users, and designing the best equipment for maintaining healthy bio-contaminant free environments. With over 35 yrs of experience in the air-duct cleaning and manufacturing business, our top engineers and biochemical experts collaborated together to create the most advanced, easy to use, portable bio-containment cart available on the market today! Only the most sophisticated products were incorporated in the Bio Cart. This enables the user to deliver the highest quality while easily navigating through even some of the smallest corridors and walkways. 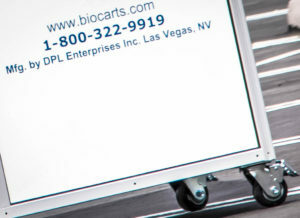 Our top engineers & biochemical experts collaborated together to create the most advanced, portable bio-containment cart available on the market today! The Bio Cart HEPA-UVC/UVGI provides containment for work on plumbing, electrical wiring, IT computer cables and fiber optic lines above the ceiling while capturing contaminates and exhausting clean air into the room. It is 32″ wide x 73″ long and 77″ high. The Air-Care Bio Cart will easily fit through most doors and elevators, with variable height adjustments that expand from 7″ to over 13″ feet high to reach the standard ceiling height in healthcare facilities. The swivel casters on all 4 corners are helpful in navigating virtually all hallways, elevators, and doorways. With swivels on each wheel, it can be rotated 360° within its own length, which allows one person to easily navigate it down long hallways, around corners, and into elevators. The Bio Cart has a winch hook for easy transport between sites while using your transport vehicle. 10″ Android tablet with proprietary Air-Care app allows wireless control of the Bio-Cart. On/Off touch control for interior LED lighting, exterior LED amber or blue lighting, UV light, blower, IN USE SIGN with light, bellows up and bellows down. When the blower is active you can view real-time air pressure. An electrical power outlet strip is located at the top of the cart, and dual outlets for recharging tools are located on the toolbox shelf. Air-Care has been in the service business since 1979. 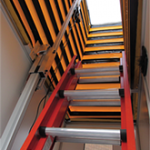 We know that adding the appropriate tools can make a job easier, thus Bio Cart has a three section extension ladder included that fits within the cart for transport. The ladder extends up to 15 feet, which is well above the over 13-foot height of the bellows. A 3 drawer tool box is also included in the Bio Cart. The back and front hinged pass-through windows, along with the cable pass through with heavy bristle air seal, allows parts and tools to be given to a technician without opening the door and compromising the negative pressure condition inside the cart. WATCH THE VIDEO BELOW TO LEARN MORE ABOUT AIR-CARE.